Every job seeker will hear this buzz-phrase at some point in time as they enter the job-search market. Yet, many people are hesitant and fearful to embrace this social media technology. The reasons include fear of the unknown, lack of technical competency or worries about privacy, among other valid concerns. So just how necessary is a LinkedIn account? What is the value of being on LinkedIn? In a 2013 survey completed by 1,600 recruiters across all industries, a whopping 94% said they use or plan to use social networking/social media for recruiting. 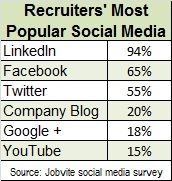 More than three quarters of those recruiters have made a hire through social media. While people in hiring positions favor LinkedIn as a recruiting tool, they still continue digging for more information on eligible candidates using Facebook, Twitter, Google and YouTube. Please understand that LinkedIn accounts are not replacing resumes. You will need a resume to apply for open positions. You’ll need a LinkedIn profile so that recruiters and employers can find you. In fact, millions of employers search LinkedIn daily! They scout LinkedIn’s database of over 160 million members using advanced keyword searches, view candidates who submitted resumes, post open positions to their network and place targeted job ads. Although it has a different function than a resume, LinkedIn is an excellent tool for job seekers. Consider LinkedIn as your “online formal introduction and two-minute elevator speech.” With this mind, it’s easy to decide what to include. Insert a professional grade picture. Remember, this is your chance to make a good first impression, so put on a suit and a smile! The headline directly underneath your picture can be your current job title or a title of a position that you are pursuing. Insert keywords that potential employers might be looking for here, if possible. Use the Summary section to express your professional personality. Write in first person, talk about your goals, interests, accomplishments and achievements. Let your passion for your career shine through, using specific anecdotes from personal, educational and professional experiences. Remember to include keywords here as well. Connect and accept invitations with people you know in your professional world. The more people you connect with, the more your name gets out there. At the same time, be cautious and strategic before accepting every invitation that comes your way. Write recommendations for colleagues. When asking people to write recommendations for you, provide them with a bulleted list of your skills, strengths and services. This will make it easier for them to write a strong, solid recommendation for you. Post any blogs or articles of interest to your network. This shows that you are keeping current in your field. Join groups that are relevant to your industry and career. Groups provide direct contact to others in your field or in related ones. Be active in your groups. Join discussions by posting questions and offering your insights to questions posted by others. Showing your expertise through group discussions has the incredible potential to promote your skills and create new, powerful and professional contacts. Follow companies that you are interested in working for. They may post job openings to their followers first. Avoid connections or associations with controversial social or political issues. If you are fearful of privacy violations, you are not alone. Although you can adjust your privacy settings, as with any social media, you can be never completely anonymous. Consider weighing the benefits versus the risks as you decide how to proceed. At the Career Center at Jewish Community Services, we teach a hands-on LinkedIn workshop, where participants are guided by the experts to create a successful LinkedIn profile and remove the fears of the unknown. LinkedIn has the power to connect you with jobs that you would never know about through traditional methods. So it’s time to take the plunge and get connected! Thanks for this summary of Linkedin! It’s helpful as I’m trying to make my profile fuller and more detailed. Question: Can a contact write a recommendation if they are not an employee or employer? I have been self employed and want to get recommendations from those I have collaborated with or assisted with their business. Yes any contact can write a recommendation recommending you and or your services and you will be able to approve it before it is posted. It is a very helpful feature for small employers or entrepreneurs.